I'm back with another semi-weekly minor league review, where we take a look at the various developmental levels of the Phillies' organization and some noteworthy players from each club. This time, it's a glance at some top performers of late, as well as those that aren't doing so well. RHP Jonathan Pettibone (pictured, right) has posted a 3-0 record with a 1.80 ERA in three starts this month for the IronPigs. Overall, combined with his time at Double-A Reading this season, Pettibone has tallied a 12-7 record with a 3.10 ERA and 100 strike outs in 142 1/3 innings. The 22-year-old was the Phillies' 3rd round draft selection in 2008. IF Cesar Hernandez is 5-for-31 (.161 avg) in his past eight games. In 16 games since his promotion to Lehigh Valley, the 22-year-old Hernandez has posted a .231 batting average. Right-handed starting pitcher Scott Elarton has gone 0-3 with a 6.98 ERA in four starts this month. The 36-year-old veteran has not recorded a win since May. OF D’Arby Myers, 23, posted a .529/.556/.647 line over the past week, headed into action on Saturday. Overall in 42 games with the R-Phils this season, Myers, who is the cousin of NBA legend Shaquille O'Neal, is batting .319 with three homers and 10 RBI. Additionally, Myers has stolen five bases in his past 10 contests. 1B/OF/DH Darin Ruf has continued his wildly hot month of August, posting a .333/.403/.841 line in 18 games this month. The 26-year-old, who was the Phils' 20th round draft pick in 2009, leads the Eastern League with a .987 OPS (2nd place individual sports a .868 mark). RHP Brody Colvin has gone 0-2 while allowing 15 runs in 8 1/3 innings (16.21 ERA) in his most recent two starts. 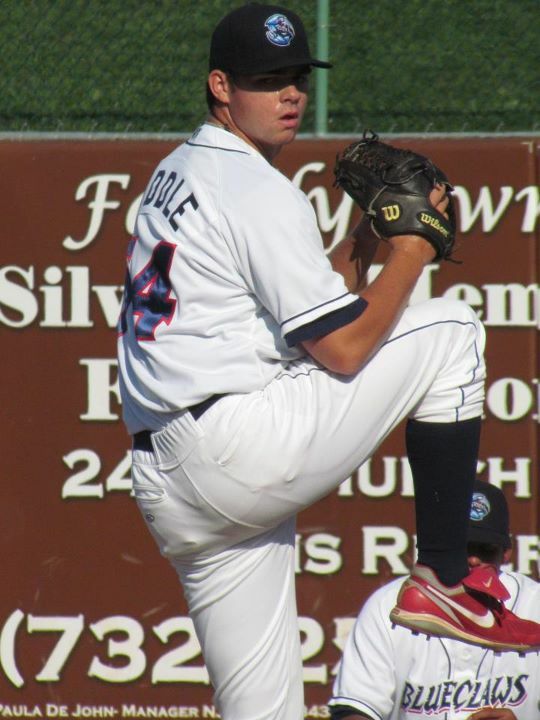 The 22-year-old, drafted in the 7th round by the Phillies in 2009, was promoted from High-A Clearwater in late July. IF Jake Opitz, who was signed as a minor league free agent recently, went 2-for-19 (.105 avg) in his first six games with the Double-A Reading Phillies. A 12th round draft pick of the Cubs in 2008, the 26-year-old was born on the same exact day as teammate Darin Ruf. Opitz was released by Chicago in spring training this year. LHP Jesse Biddle (pictured, left) is 3-1 with a 2.49 ERA in four August starts. The Phillies' top draft selection (27th overall) in 2010 is 9-5 with a 3.26 ERA and 9.51 K/9 in 26 starts for Clearwater this year. Biddle, a Philadelphia native, is 20-years-old. OF Peter Lavin, a 24-year-old lefty hitter, is 11-for-28 (.393 avg) in his past seven games. An All-Star with the Threshers in the Florida State League this year, Lavin was the Phils' 20th round draft pick in 2011. Overall the University of San Francisco graduate is sporting a .266/.315/.369 line this season in 104 games. First baseman Jim Murphy has posted a .179 batting average over his past 10 games. The 26-year-old was the Phillies' 17th round draft selection in 2006. Overall this season, the Washington state native has tallied a .264 average with 14 homers and 75 RBI for Clearwater. Catcher Gabriel Lino, acquired from Baltimore in the Jim Thome trade, has posted a .371 average with five doubles, two home runs and seven RBI in 10 games this month. This output is much improved from the .141 average, three doubles, no homers and two RBI that the 19-year-old Lino notched in his first 18 games in the Phils organization. Brock Stassi (pictured, right) went 8-for-21 (.381 avg) with a double, a homer and 4 RBI over his previous five games entering Sunday. Through 13 August games, the 23-year-old Stassi sported an .839 OPS after recording a .648 mark in 28 July games. Stassi, a graduate of the University of Nevada, Reno, was chosen in the 33rd round of the 2011 draft. SS Tim Carver, a 19th round draft pick in this year’s draft out of the University of Arkansas, went just 4-for-40 (.100 avg) in his past 10 games. The 23-year-old right-handed hitter has a .192/.272/.272 line in 40 games since making his pro debut with Lakewood. Righty reliever Yari Sosa appeared in two games last week, allowing seven earned runs in 2 1/3 innings (27.04 ERA) and tallying a 1-1 record. The 21-year-old Dominican’s season ERA rose over a run, from 4.72 to 5.91, after his troublesome week. Right-handed hurler Steven Inch, a 6th round draft choice in 2009, has posted a 2-0 record with a 2.00 ERA in five relief outings this month. The 21-year-old Canadian sports a 2-1 record with a 4.96 ERA and a .311 batting average against in 17 appearances this season. Third baseman Mitch Walding was 3-for-35 (.086) in his previous 10 games entering action on Sunday. The Phillies' 5th round draft pick last year was batting .235 with one homer and 25 RBI through 52 games with the Crosscutters. Walding, a lefty hitter, is 19 years old.